What is there to do on a beautiful sunny day in St. Louis you ask? How about we head down to Vintage Vinyl record store and check out Cage the Elephant. First off, I gotta say I’m a Cage the Elephant fan and have been since first hearing “No Rest for the Wicked”. I became an even bigger fan after seeing them perform live last year in Dallas at Edgefest. So getting to see the band give an intimate performance at Vintage was right up my alley. Cage wasted no time jumping in to the quick four-song set by opening with “No Rest for the Wicked”. 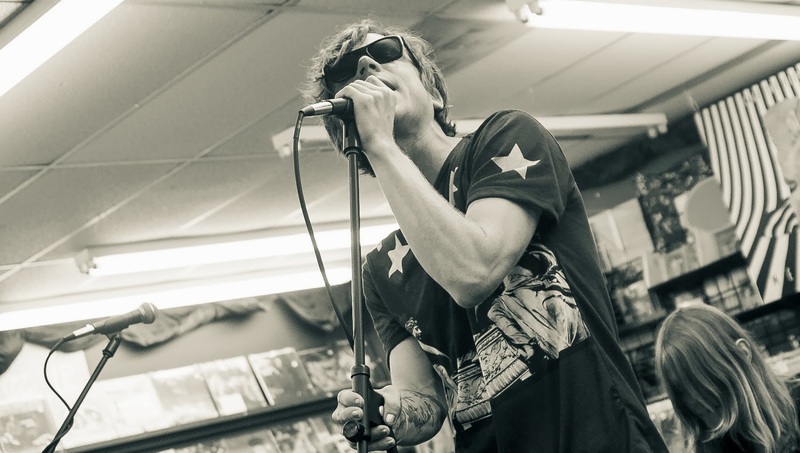 Frontman Matt Shultz battled through and made the best of some early microphone problems by encouraging the Vintage audience of about 100 to sing the chorus of “No Rest...”; which they did on cue. The rest of the band’s time on the stage was flawless and included the songs “Come a Little Closer”, “Back Against the Wall”, and “Shake Me Down”.